Czech property prices increased 8.7% YoY in 3Q18, based on the House Price Index (HPI) – a broad measure of residential property prices among EU countries, which includes both prices of existing and new family houses, flats and land. 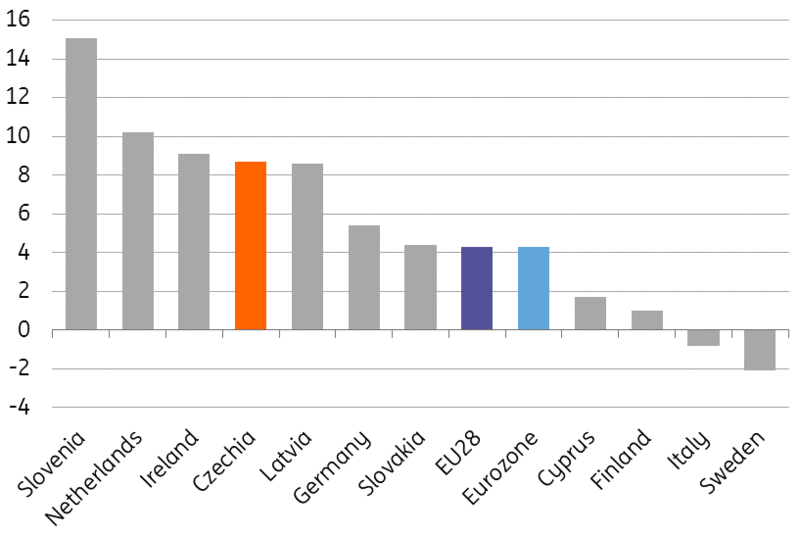 This represents the fourth highest YoY growth rate among EU countries, just behind Slovenia (15.1%), the Netherlands (10.2%) and Ireland (9.1%). Prices of new dwellings saw even higher annual growth of 12.8% YoY- the second highest in the EU after the Netherlands (16.9% YoY), though new dwellings in the Czech Republic have a weighting of just approx 10% in the total HPI. Despite a relatively strong 3Q18, average 2018 HPI growth reached 8%, ranking seventh among EU countries. This was down from the 12% YoY growth seen in 2017, which was the highest rate in the EU. However, this still means that the average growth in the Czech property market is almost twice as high as the EU-average. Accelerating property prices in 3Q18 came as a surprise to the market, which was expecting a gradual slowdown. However, this might be due to the frontloading effect related to the introduction of stricter macroprudential recommendations of the Czech National Bank (CNB). Indeed, the CNB announced in mid-2018 that banks should apply new income limits from October 2018 (no higher loan than nine times net yearly income or/and monthly instalment exceeding 45% of net monthly income of the borrower, while loan-to-value limits remained unchanged at 90%). Due to concerns of tighter housing loan conditions by some households, demand for credit financing surged in 3Q. As such, new housing loans increased by almost 30% YoY during July-October, which had a potential impact on property prices in 3Q18. Some natural demand for 2019 was realised in 2H18 due to the frontloading effect. However, because of the insufficient supply of new flats, mainly in bigger Czech cities, related to administrative obstacles which have hindered new building permits, a more pronounced price decline is not a likely scenario, in our view.